Home > Symptoms > Quiz: is Your Child Gluten Intolerant? It’s important to remember that there are differences between wheat allergies and gluten intolerance and that food reactions in young people may be physical, emotional or psychological. When a child is in distress, it’s difficult for a parent to take a dispassionate view of the situation and these questions should be seen only as a guide to some of the likely reasons for certain responses to food. Self-diagnosis should never take the place of medical assessment but examining a child’s reactions and behaviours can help you recognise when it is time to seek expert help. A. 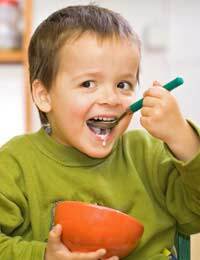 Can your child eat rye, oats and barley without problems? C. Is it purely wheat and gluten containing foods that trigger the negative response? If your answer is A it is likely that your child has gluten intolerance although he or she may have general food allergies too. If your answer is B, your child may have gluten intolerance but may also have an autoimmune condition such as lupus or Crohn’s. Clear medical diagnosis is essential. If your answer is C, your child is almost certainly gluten intolerant and will benefit from a gluten excluding diet. A. Has the child with an apparently gluten allergy, any of the following conditions: Type 1 diabetes; Autoimmune thyroid disease; Dermatitis herptiformis; Down or Turner or Williams Syndrome? B. Does the child who is reacting to gluten have any other unusual behaviours such as refusing to eat with others, refusing to eat certain foods, saying their gorge rises when they are forced to eat? C. Does another child in the family have food allergies and is the child with an apparent gluten allergy much worse when eating in company with his or her sibling? If your answer is A, then gluten intolerance may be an underlying problem that is related to the primary condition. If your answer is B, your child may have a psychological eating disorder, which is worsened by observation – this may have arisen as an anxiety mechanism and become a habit. Counselling or CBT is a good route to take as early as possible in such cases. If the answer is C, your child may have a psychosomatic reaction to associating with another child who does have a food allergy – their reactions may be based on the stress or pain they see in their sibling’s reactions to food. Family therapy will help one child separate their sympathy for a suffering companion from their own reactions to food. A. Does your child have more than two of the following symptoms after eating gluten-containing foods: abdominal distension or bloating; bone or joint pain; flatulence; headache, nausea and vomiting? B. Has your child ever been diagnosed with: anaemia; obesity; low bone density; sleep apnoea? C. Would you say your child is generally: tired - especially after eating; prone to swinging between constipation and diarrhoea; noted for having a poor appetite and for lingering over food? Surprisingly enough, all the symptoms listed in A,B and C are indicative of gluten reactions and should be checked out by a medical practitioner.